You give Alaska Radio Mission life with your prayers and financial contributions. Unexpectedly, contributions took a serious drop last month, and as you’ll see toward the end of this newsletter, we were hit with several unusual and unavoidable expenses. We can’t pay all of our bills and are looking at putting all projects on hold. For KNOM, this is thankfully rare, but it is serious and pressing. We thank you most sincerely for your prayers for our mission and for your help. If you have a friend who might be willing to lend us a helping hand, will you please ask for us? Many parishes have social action committees which contribute to work like ours. In fact, about three dozen parishes contribute to KNOM. Might yours be interested in joining them? Again, you are our strength. Thank you for your kindness to the remote people whom we serve. WELCOME: (left) KNOM’s newest volunteer is Jacob Buckenmeyer. From Mount Vernon, Washington, Jacob graduated from Western Washington University with a degree in journalism. This past summer, he worked as an intern with Catholic News Service. He serves as news reporter. In his spare time, Jacob likes to read, write, target shoot, and he’ll “try to get back to wood carving.” Welcome! 31,000: That’s about how many inspirational spots KNOM has broadcast so far this year, thanks to you. Thank you! IMPORTANT programs on KNOM recently included interviews and call-in shows on topics like the government’s response to climate change in western Alaska and the opportunities and challenges of recycling in this region and the No Child Left Behind Act. As the region slowly is joining the Internet, there was one stirring discussion, as callers spoke with an Anchorage sting operation detective about how to keep their children safe from sexual exploitation. Thank you again for making this kind of programming possible in the bush of Alaska. Dear Lord, help me to listen, to understand the feelings of my friends in their moments of joy or pain, happiness or sorrow. Help me to hear the thoughts of friends and relatives in good times and in bad, as we face life together as a family. Help me to hear Your Voice, God, as You walk with me and guide me each day. Amen. INSPIRATIONAL SPOT: Oh, Lord, in my present need, help me to believe that You are aware of my anxiety, and will do what is best for me. Give me the strength to trust You and put the present and the future into Your merciful hands. Grant this through Jesus Our Lord. Amen. (Left) A. G. “Augie” Hiebert, at KNOM’s 25th anniversary celebration, July 14, 1996. LOSS OF A GREAT FRIEND: We mourn the death of Augie Hiebert, without challenge, Alaska’s greatest broadcaster, without whom KNOM would not exist. 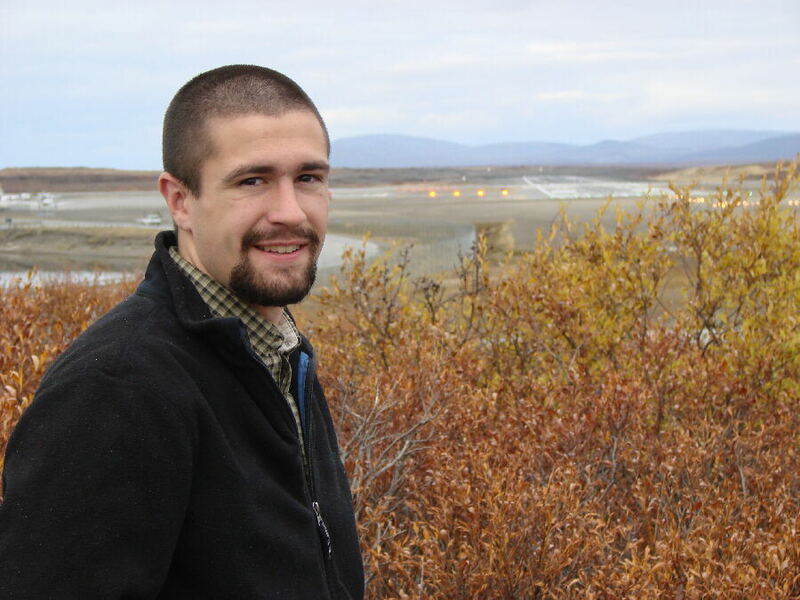 A convert to Catholicism, Augie flew to Nome when he learned of the fledgling attempts toward a Catholic radio station. In 1967, he filled out the paperwork for an FCC construction permit. His close friendship with Senator Ted Stevens helped sweep away several major federal roadblocks to the Nome Catholic radio project. Without him, it would have floundered. 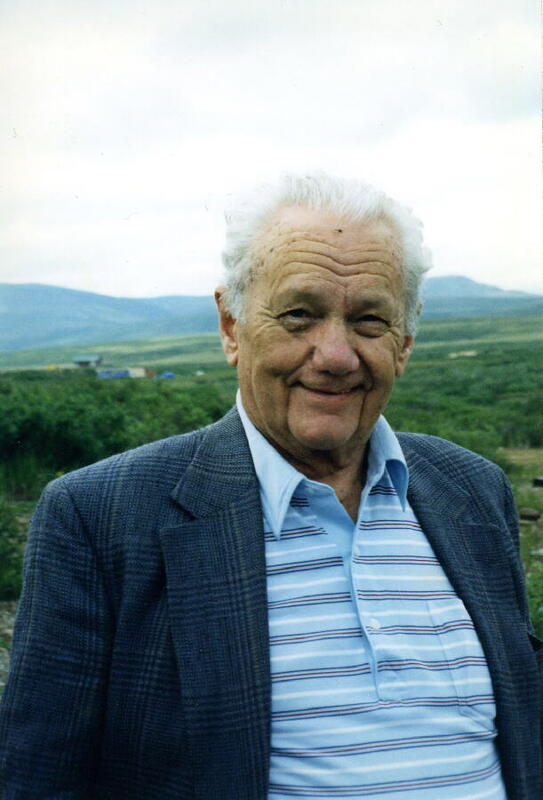 Augie came to Alaska in 1939, as construction engineer for Fairbanks’ first radio station. Once the station was built, one of his duties was copying United Press International news from shortwave radio Morse Code. On December 7, 1941, he was the first person in the Territory of Alaska to learn of the attack on Pearl Harbor, and notified the Fairbanks Army post. Later, he struck out on his own, building Alaska’s first television station in Anchorage in 1953, Fairbanks’ first in 1955, and Alaska’s first FM station in 1960. Augie’s company was about to turn its first profit in 1964, when his Anchorage facilities were extensively damaged in the devastating Good Friday earthquake, the most powerful ever recorded in North America. Three years later, his Fairbanks facilities were destroyed in a flood. A fighter, Augie rebuilt, heavily mortgaging his personal property to do so. Always close to military brass, Augie convinced them to use a military satellite channel to bring Alaska its first live broadcast from outside the state: Neil Armstong’s lunar walk. For the event, Alaska Airlines offered reduced fares to Anchorage. Augie was a visionary. It was his drive and influence that brought satellite communications to Alaska in 1970, and to hubs in the bush like Nome in 1974. Throughout his 68-year career in Alaska, Augie continued to look forward, and he was especially interested in helping young people learn communications skills. In 1958, he sponsored Alaska’s first live television program that was entirely produced by teenagers. At the time of his death, he spearheaded a project that created a low power FM station for a local middle school. At KNOM, we think of him as a father. In addition to everything else he did for us, he continued to be a regular, major contributor. Tom Busch remembers: “En route to Nome, I was instructed to first meet with Augie in Anchorage. On February 3, 1970, my first full day in Alaska, having no idea of his immense stature in the broadcasting community, I breezed into Channel 11 to see him. I think he was amused by my ignorance. He swept everything off his desk and took care of me for the rest of the day. Taking me to his home, he handed me the 5-inch-thick Nome Catholic radio file. ‘It’s all yours, son,’ he told me. “About twenty years later, Augie called me a friend, and I took that as a tremendous compliment. Among his other friends was Walter Cronkite. He knew many people of great influence. “I could tell so many stories." “In 1982, Augie accompanied a few of us to Washington, D.C., to lobby the FCC for distant signal protection for Alaskan AM stations. (We were successful.) We were having breakfast at a hotel on a Saturday morning when Augie asked if we’d like a tour of CBS-TV’s Washington news bureau. He dialed the number that CBS answers on Saturday mornings, and a few minutes later, we were being given the grand tour by none other than newsman Bob Schieffer. “In his final years, at every opportunity when a KNOM staffer or new volunteer was passing through Anchorage, I’d take them to meet Augie. He greatly enjoyed the visits, and treated them to his agile, teasing humor. “I last saw him at the funeral for another Alaska broadcaster in June. For the first time, he had lost his spark. It turns out that he was in considerable pain, though he worked hard to conceal it. “Those of us who have been in the Alaska broadcasting community for a while share one sentiment: We greatly miss him. To me, the father of KNOM was a favorite uncle whom I continue to admire immeasurably. INSPIRATIONAL SPOT: Only through wholehearted living do we truly live at all. Perhaps some of us fail to fully live because we fail to appreciate from where, and to where, we are going. It’s not vanity to recognize our own place in life and then our fitness for it. Let’s not waste our time envying others, but rather, devote ourselves to the productive use of our own abilities. God intends each of us for a very special job. Whatever our vocation or mission in life, He calls us to be men and women for others. INSPIRATIONAL SPOT: I expect to pass through life but once. If, therefore, there be any kindness I can show, or any good things I can do to my fellow being, let me do it now and not defer or neglect it, as I shall not pass this way again. 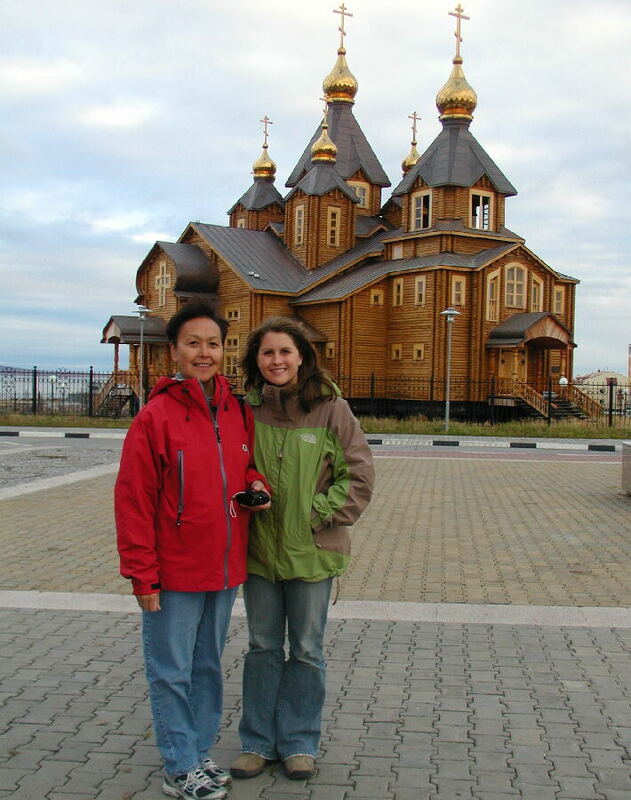 “RUSSIAN” AROUND: (left) At left, Alaska Eskimo Walrus Commission head Vera Metcalf and KNOM public affairs director Amy Flaherty stand in the town square, in front of Saint Trinity cathedral. The city? Anadyr, Russia, 511 miles west of Nome. 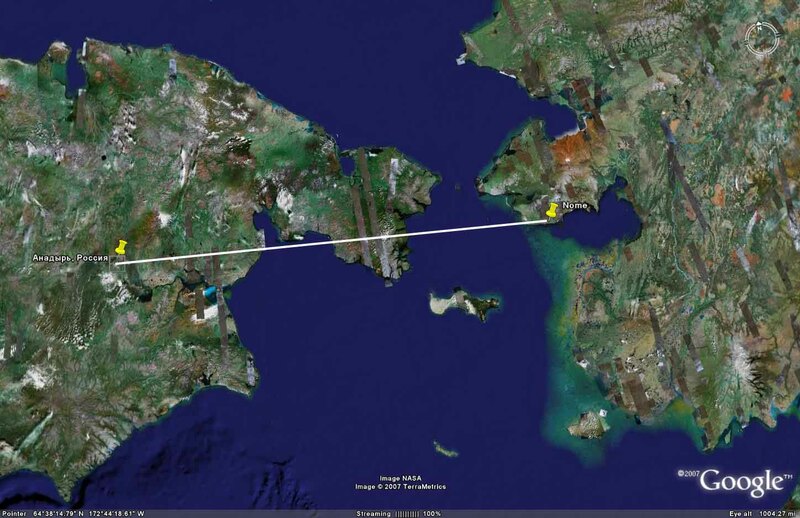 Amy flew there by small plane to cover a meeting of the Beringian Heritage Program. Vera was there to participate. Beringia Days, begun eleven years ago, is an annual joint meeting partly coordinated by the U. S. National Park Service. The American-Russian project promotes open communication and cooperation in the Bering region. It’s a multi-purposed effort involving exchanges of culture, science, and resource management on both sides of the Bering Strait. Amy is just the fourth KNOM reporter to travel to Russia since the “Ice Curtain” border was partially opened in 1989. Curiously, with 11,000 residents, Anadyr is the closest town of that size to Nome. (Left) A map of the incredibly remote route between Nome and Anadyr, Russia. This month, 525 people receive the newsletter, and 88 respond with gifts. BUDGET BUSTERS: The past two months, we’ve suffered several painful maintenance expenses, as our buildings have just reached the age where they need a touch-up or two. Battening down for the winter, we needed to level our cold storage building (which is sitting on wooden blocks), replace the emergency generator fuel tank, repair the volunteer house boiler, replace some flooring, repair steps, and so forth. In two months, these maintenance expenses have cost $15,094, which is five times what maintenance cost us all of last year. Ouch! As ever, we offer you and all of your intentions in our prayers. Thank you again, so very much. May Our Heavenly Father reward you a thousand fold for your generosity.